24 Units of Yacht & Smith Womens Cotton Striped Tube Socks, Referee Style size 9-11 - Women's Tube Sock at low wholesale prices. 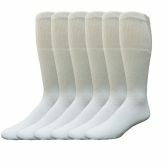 alltimetrading.com offers Women's Tube Sock at bulk discounted prices. SKU: 1950257 Free same day shipping. SKU: 2023097 Free same day shipping. SKU: 2031401 Free same day shipping. SKU: 2031409 Free same day shipping. SKU: 2031417 Free same day shipping.